“This is the day of the Lord’s victory. Let us celebrate.” Psalm 118:24 TEV. The impossible is what God does best. I have observed that life presents both obstacles and opportunities. It is unrealistic to presume you will have either without the other. Every opportunity presents an obstacle; every obstacle presents an opportunity. The bigger the opportunity, the greater the obstacles. The greater the obstacle, the bigger the opportunities will be. You learn a lot about your own character when you experience obstacles. And in every obstacle, God offers an opportunity to learn about His character as well. “This is the day of the Lord’s victory. Let us be happy. Let us celebrate.” Psalm 118:24 TEV. Any day is a good day when you are offered the opportunity to walk and live in His victory. Take a few minutes to read Joshua 1:1-10 and Joshua 3:1-17 NIV. Joshua and Israel faced serious obstacles; an uncrossable Jordan and an invulnerable Jericho were both impediments to entering Canaan, the land of God’s promise and plenty. Why would the armies in Jericho neither offer opposition to Israel crossing Jordan nor demonstrate any active resistance as they marched around Jericho seven days? I suggest, with such flooded dimensions and depth of the Jordan, they must have assumed it unimaginably impossible for two million people to navigate such a crossing, just as they believed the capture of their city to be impossible. The impossible is what God does best. Under the cover of darkness, Joshua sent two men went into Jericho to assess the situation ahead. What they heard was that Jericho was more afraid of them than they were of Jericho. Fear creates battles that God has already fought and won. A Canaanite woman in Jericho said, “I know the Lord has given you the land . . all the inhabitants of the land are fainthearted because of you. We have heard how the Lord dried up the water of the Red Sea when you came out of Egypt . . our hearts melted . . no courage remained in anyone because of you, for the Lord your God is God in Heaven and in earth.” Read Joshua 2:9-11 NIV. Imagine! 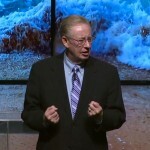 Canaan’s current and continuing fear began more than forty years earlier, when God drowned the Egyptian army and divided the Red Sea for Moses to lead newly liberated people across on dry land. Upon return to Joshua, their report was with assurance and certainty, “The Lord has surely given the whole land into our hands; all the people are melting in fear because of us.” Joshua 2:24 NIV. But first they still had to cross the treacherous currents of a flooding Jordan. God always makes a way where there seems to be no way. With divine authority, Jesus said, “The things that are impossible with men are possible with God.” Luke 18:27 NKJV. But be prepared, God’s way will be what you least expect and never imagined. God said, “’For My thoughts are not your thoughts, neither are your ways My ways,’ says the Lord. ‘As the Heavens are higher than the earth, so are My ways higher than your ways, and My thoughts than your thoughts.’” Isaiah 55:8-9 NIV. Maybe you face an obstacle, feeling uncertain of the path forward. Sometimes the past feels difficult to overcome; sometimes the future seems unsure and concerning. “This is the day of the Lord’s victory. Let us be happy. Let us celebrate.” Psalm 118:24 TEV. Let me remind you that the God Who makes a way where there seems to be no way knows where you are and what you need, and He is able to do “immeasurably more than all we ask or imagine, according to His power that is at work within us.” Ephesians 3:20 NIV. Today can be your day of victory. Celebrate! Today, I pray for you that you will believe God for the impossible. “Our only power and success come from God.” 2 Corinthians 3:5 NLT. Success without satisfaction is failure not success. Success is a more complex subject than might first be assumed. Sir Winston Churchill captured the process as, “moving from one failure to another with no loss of enthusiasm.” Ultimately, success requires an untiring enthusiasm and expectation. Let success be your goal, but make satisfaction your measurement of success. Success is a common, even innate, desire of the human spirit. God wills your success. About that fact, the Bible is clear. “Beloved I pray that in all respects you may prosper and be in health, even as your soul prospers.” 3 John 2 NASB. God wills you to enjoy financial sufficiency, ample health and strength, measured by a singular standard, “as your soul prospers.” “Our only power and success come from God.” Read 2 Corinthians 3:4-5 TLB. Apart from the spiritual dimension, whatever measure of success you achieve will be unsatisfactory. Success without satisfaction is failure not success. Do not let the world around you dictate what success is for you. The apparent success of others may mislead you into assuming your success will look like theirs. The Bible warned, “We do not dare to classify or compare ourselves with some who commend themselves. When they measure themselves with themselves, they are not wise.” 2 Corinthians 10:12-13 NIV. The world measures success by tangible acquisitions, notable achievements, popular approval, others’ applause, or material gain. “Then I observed that most people are motivated to success by their envy of their neighbors. But this, too, is meaningless, like chasing the wind.” Ecclesiastes 4:4 NLT. The world’s standards are different from what God values. You must decide to which you will give irreplaceable years of effort, energy, and expense. Establish your personal definition of success. Without Godly benchmarks for measuring, you may not know when you achieve it or recognize when you have not. Contentment and satisfaction with what you achieve is a more reliable measurement of success than the tangible rewards that result. For me, where I find the greatest satisfaction and most prize any measure of “success” are family and ministry. I will count Gayle’s and my success by the fruit of our family’s lives, the faith and values we hold in common, enjoying and loving one another’s company, and our mutual love and service for the Lord and His Church. Our family is central to my definition of success with satisfaction. As for ministry, I evaluate ministry on the twin bases of obedience and faithfulness to God’s call, having done what He asked and been faithful where He placed me. Honest appraisal reminds me that God’s grace and people’s graciousness have been the source of success. Today, I pray for you to measure success by the satisfaction you find in doing God’s will. 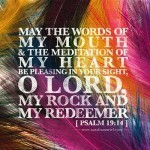 “Let the words of my mouth be acceptable in Your sight.” Psalm 19:14 NKJV. What is experienced in your heart will be expressed in words. Words are important, having immeasurable power and potential beyond what you may imagine. With words, God created the world and everything that exists came to be. Genesis states the process this simply, “And God said, ‘Let there be . . and there was . .’” Genesis 1. Read John 1:1-3/14 NKJV. Value the inherent power of words. Needless excess of words discounts individual value. Solomon, a wise man, said, “The fool multiplies words . . In the multitude of words sin is not lacking, but he who restrains his lips is wise.” Ecclesiastes 10:14 NIV/ Proverbs 10:19 NKJV. There are people who would do well to understand that principle when it comes to their words. Frequently, people talk too much. When they do, their words are devalued. “Do not be rash with your mouth . . let your words be few.” Ecclesiastes 5:2 NKJV. God views the unredeemed and unrestrained tongue as, “an unruly evil, full of deadly poison. With it we bless our God and Father, and with it we curse men, who have been made in the [likeness] of God. Out of the same mouth proceed blessing and cursing.” Read James 3:8-12 NKJV. Words have incredible power. Your words can build up; they can tear down. Words can help; they can hurt. Words can heal; they can harm. Learn to speak the language of blessing. “Set a guard, over my mouth, O Lord; keep watch over the door of my lips.” Psalm 141:3 NIV. Use words well and speak them wisely. Know when to speak; learn when to keep silent. To be considered wise, be disciplined with your words, “Let no corrupt word proceed out of your mouth, but what is good for necessary edification, that it may impart grace to the hearers.” Ephesians 4:29 NKJV. Your words have a God-given potential to edify. Everyone needs to receive words that generously express grace. Let your speech be always with a loving voice. The Psalmist prayed, “Let the words of my mouth and the meditation of my heart be acceptable in Your sight, O Lord.” Psalm 19:14 NKJV. The more you meditate on God’s Word and allow His truth to dwell in your heart, the more your thoughts and words will sound like His. Read 1 Thessalonians 2:13 NKJV. Your words are learned from the thoughts you entertain and the voices you listen to most frequently and most highly regard. What is experienced in your heart will be expressed in your words. Luke 6:43-45 NIV. I want that to be the voice of the Holy Spirit and the truth of the Word of God in my heart. This all begins here, “Let the word of Christ dwell in you richly in all wisdom, teaching and admonishing one another in psalms and hymns and spiritual songs, singing with grace in your hearts to the Lord. And whatever you do in word or deed, do all in the name of the Lord Jesus.” Colossians 3:16-17 NKJV. Today, I pray for you to always listen for His voice and obey all He says. “As for me and my household, we will serve the Lord.” Joshua 24:15 NIV. Your history need not determine your destiny. When my Dad died in a highway accident at a young age of forty-four years, he did not leave many material things – a small house worth only what was owed on it, and an insurance policy for four thousand dollars. Invaluable to me, my Dad left something that still shapes much of who I am and what I believe. As was said of a young, Judean king, Josiah, I would describe my Dad in those same words, “He did what was right in the eyes of the Lord.” 2 Kings 22:2 NIV. I realize how often his words and personal example deposited practical, Godly wisdom that still guides my actions and decisions, long after his life ended. My dearest of friends, Campbell, was twenty-six years my senior and thirty-three years my friend. He still is in my heart; his life not his death occupies my thoughts of him. Like my Dad, Campbell left a legacy of righteousness to me – and many others – by his exemplary character and spiritual integrity. He held little concern that I be like him but modeled a holy passion that I be more like Jesus. Paul gave practical advice, “Since you are God’s dear children, you must try to be like Him.” Ephesians 5:1 TEV. I am a better man, husband, father, pastor, and friend through the influence of his friendship. “He did what was right in the eyes of the Lord . . not turning aside to the right or the left,” was written about Josiah, King of Judah, who reigned for thirty-one years beginning at the age of eight. His father, Amon, and grandfather, Manasseh, were notorious. Their record was despicable not enviable, a shameful history of idolatry and evil, committing wrongs against men and sins against God. Your history need not determine your destiny. Instead of his parentage, Josiah chose a Godly example to follow. “Josiah . . walked in all the ways of David.” 2 Kings 22:2 NIV. Josiah chose a different path, a path in which he did what was right. You did not choose your history, but you must choose your destiny. Josiah found and followed God’s Word. Read 2 Kings 22:8-23:25 NIV. Of Josiah, the Bible says, “Neither before nor after Josiah was there a king like him who turned to the Lord as he did – with all his heart and with all his soul and with all his strength.” 2 Kings 23:25 NIV. Jesus said the first commandment is, “Love the Lord with all your heart, soul, mind, and strength.” Mark 12:30 NKJV. Choose the path you take. Choose a Godly heritage for your family. “Choose for yourselves this day whom you will serve . . 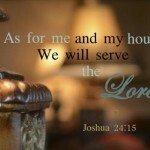 But as for me and my household, we will serve the Lord.” Joshua 24:15 NIV. You have a choice in your destiny; you have a voice to a next generation. Right is not always the popular way nor least costly, but doing what is right is always the right thing to do. Your legacy to the next generation depends upon your Godly example today. Today, I pray for you to seize every opportunity to choose what is right and live pleasing to God. “Therefore, God is not ashamed to be called their God.” Hebrews 11:16 NIV. Live so your family and friends have no cause for embarrassment. As a teen, I recall occasions when my father wisely reminded me, “Allen, remember; you are a Randolph.” His words were not of distrust, but of his trust and expectation of me. From his words, I understood that my conduct and conversation should reflect positively or would reflect negatively on others as well as myself. Shame is a negative, but healthy, emotion you feel when you behave in a less worthy manner than you or others should expect. I am ashamed of some things I have said and done across the course of my life, and thankful to God and others who have shown me love and grace in spite of that. Along the way, I hope I have learned to do better. Though admittedly as human as the next person, my aspiration is to live so my family and friends have no cause for embarrassment. Though not an exhaustive list, the twelfth chapter of Hebrews describes multiple people of exemplary faith in these words, “They were longing for a better country – a heavenly one. Therefore, God is not ashamed to be called their God.” Read Hebrews 11:13-16 NIV. To me, that is the most incredible description of grace and the confident power of God.Grace includes you in that noble company of saints. Read Ephesians 2: 4-10 NIV. I know that my name is linked to His in grace. Imagine the power of that and personalize the Bible’s affirmation; read it aloud right now; “God is not ashamed to be called my God.” It is neither pretentious nor presumptuous to affirm that as true. Let its transforming truth sink deeply into your heart and spirit. Dare you and I believe, that in Christ and by the power of the Holy Spirit, we can live in a manner that God is not ashamed to be called our God. How dare we not believe what God has said to be true? Paul had every expectation of that truth, “According to my earnest expectation and hope that in nothing I shall be ashamed, but with all boldness, as always, so now also Christ shall be magnified in my body, whether by life or by death.” Philippians 1:20 NKJV. “Both the One who makes men holy and those who are made holy are of the same family. So Jesus is not ashamed to call them brothers.” Read Hebrews 2:10-12 NIV. It reassures and comforts me that God chose to identify Himself to Moses affirming, “I am the God of Abraham, Isaac, and Jacob.” Exodus 3:15 NKJV. The record of each was less than sterling. But God was not ashamed to be called their God. At the end of my life, it will be satisfaction enough to hear my Savior say, “Well done, good and faithful servant.” I want to live in the strength of my Dad’s belief in me and my Heavenly Father’s grace toward me. Read 2 Timothy 1:12-14 NIV. Today, I pray for you to live as honors Jesus, with neither shame nor regret. Devotionals 2 Timothy 1:12-14, Abraham, affirmation, aspiration, conduct, Dad, Ephesians 2:4-10, exemplary faith, Exodus 3:15, faith, faithful servant, father, Grace, healthy emotion, Heavenly Father, Hebrews 11:13-16, Hebrews 2:10-12, holy, Holy Spirit, Isaac, Jacob, Moses, negative emotion, noble company, Philippians 1:20, shame, truth, unashamed, well done!